The Battle of Gloucester was a skirmish fought early in the American Revolutionary War at Gloucester, Massachusetts on August 8 or 9, 1775. Royal Navy Captain John Linzee, commanding the sloop-of-war HMS Falcon, spotted two schooners that were returning from the West Indies. After capturing one schooner, Linzee chased the second one into Gloucester Harbor, where it was grounded. The townspeople called out their militia, captured British seamen sent to seize the grounded schooner, and recovered the captured ship as well. The skirmish was one of a series of actions that prompted a retaliatory expedition by Royal Navy Captain Henry Mowat in October 1775. The major event of his cruise, the Burning of Falmouth, was cited by the Second Continental Congress when it established the Continental Navy. In April 1775, tensions between British colonists in the Province of Massachusetts Bay and the royal governor, General Thomas Gage, boiled over into war. When General Gage dispatched troops to Concord to search for military supplies the colonists had stored there, alarms were raised, and colonists and soldiers clashed in Lexington and Concord on April 19. Militia companies continued to arrive in the days following, and the British troops were besieged in Boston. The siege, which only blockaded land access to the city, made the army dependent on the ability of the navy to supply it with fresh provisions. 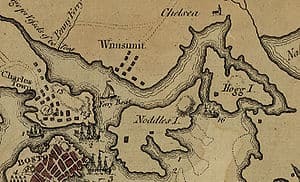 In many communities near the city, livestock and hay were removed from islands in Boston Harbor and the immediate coastal areas, while General Gage and Vice Admiral Samuel Graves sent out expeditions to raid coastal communities for livestock and hay, and to interdict colonial shipping. When these expeditions landed troops or sailors to round up livestock, they were sometimes met with resistance. 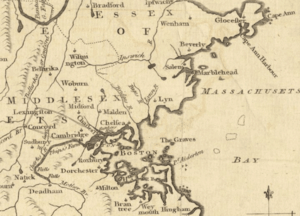 Not long after the siege began, colonists and army troops clashed on May 27 near Boston over supplies on a nearby island. On August 5, the HMS Falcon, commanded by John Linzee, appeared off Ipswich Bay. Captain Linzee sent a barge of men to the shore in search of livestock. A local farmer observed the activity, and, together with a few other local men, drove the barge off with musket fire. When the barge returned to the Falcon, Linzee sent it to investigate a schooner in the harbor; this ship turned out to only contain ballast. 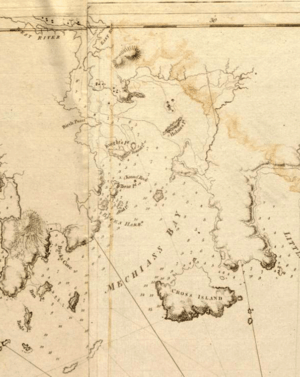 Linzee continued to cruise off Cape Ann for the next few days, and impressed some men from local ports and ships. Linzee’s attempt to burn the town as a punishment for resisting his actions was echoed in later naval actions. In October 1775, Admiral Graves ordered Captain Henry Mowat on an expedition of reprisal against New England’s coastal communities, specifically including Gloucester as a target, and citing among other justifications Captain Linzee’s defeat at Gloucester. Mowat chose not to attack Gloucester, since he felt its buildings were too widely spaced for cannonades to have any significant effect. Reports of Mowat’s only major action, the Burning of Falmouth (present-day Portland, Maine), were instrumental in motivating the Second Continental Congress to establish the Continental Navy.